Akai Professional & ADSR are proud to bring you the latest in our genre specific sound packs. MPC users rejoice as the Billboard charting production team GHST PRJKT work alongside Akai pro to deliver the outstanding URBAN ESCAPADE which features the latest drum and melodic samples along with stunning preset instruments for producers to load directly in Standalone or Software modes. If you’re after the sounds of producers and artists such as Noah "40" Shebib, Mike Zombie, Party Next Door, Roy Woods and Majid Jordan, then this release has exactly what you need. Dark epic pads, saturated 808 bass tones, moody reverb plucks, high passed leads and ambient keys all playable in MPC also expanding your instruments for all Standalone MPC’s. This release also includes a collection of custom made samples that nail the OVO sound. Muffled kick drums, tight gated snares, LP filtered 808 kicks, music loops and unique vocal cuts will get your productions going in the right direction for a charting track. These sounds are the exact ones used from some of the best top lines the team at GHST PRJKT has written. This is just the beginning of premium MPC content from the vaults of GHST PRJKT/ADSR. As usual, Akai provides you with only the best and most authentic sound available. Each kit provides you with an excellent selection of samples and patterns that have been expertly programmed to instantly inspire you, no matter what music making mood you’re in. 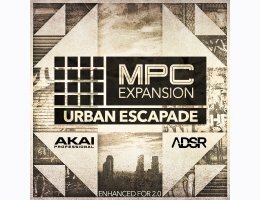 Download a Demo Kit for Urban Escapade here!